That’s interesting. If I remove the web.xml from my project it fails on page load, I suspect the discrepancy is something to do with the differences in the pom.xml files between our projects. When I get some time I’ll investigate the cause further. Nevertheless, it does no harm to leave it in and if it makes a project less sensitive to classpath changes then all the better. Thank you for raising this though. Why your pom.xml has following instruction? This is required because I’m running JSF scoped beans in an embedded Tomcat container and that’s where JSF will scan for them. I think it only happens in Eclipse but it needs checking. Alex, I read your valuable article carefully. I think src/main/webapp folder is not necessary with spring boot JAR packaged. JSF resources (xhtml, js, css) should be located at src/main/resources/META-INF/resources folder. This example uses jsf-spring-boot-starter that solves JSF and Spring Boot integration issues. when i use postconstruct annotation in my managed bean ,nothing it perform , do you know why and do you have any solution for this problem ? Have you tried to build the jar and run it with java -jar boot-faces-1.0-SNAPSHOT.jar ? 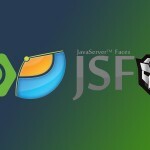 Thanks for this post, It has helped to Integrated JSF with Spring boot and it is working fine. But I have another challenge to integrate CDI along with JSF with Spring boot (Embedded Tomcat) for @BeanManager(javax.enterprise.inject.spi.BeanManager) required in the applicaton. Please help with CSI Integration with Spring Boot + JSF (tomcat)..